The competition at the five paddleball courts off Carmine Street in Manhattan was ferocious. No one wanted to lose and all of us fought like mad, yelled like mad, disputed calls like mad, to avoid it. But, in the end, one team got to 15 before the other. The winner stayed on. The loser trudged to the sidelines to await their next chance. And wait. And sometimes wait some more. The courts were not just ferocious. They were crowded. Sometimes the waits extended to ten games. And waiting was not something we were good at. We were competitive athletes and wanted to do something. Well, there was a bocce area behind the courts if you wanted to roll a ball. And there was a small softball field where you could kick a soccer ball. Or you could go to the store and get something to drink. Billy Abolafia did none of those things. Billy was one of the characters at Carmine Street. Tall, powerfully built, with long, curly hair, he was a charismatic figure that drew people to him. He was also a gambler. He brought his cards and set up a poker game on the cement tables and wooden benches just a few feet beyond the courts. Losing players came to join in. I came to join in. The game was quarter/half. Open for a quarter with three raises allowed. If someone showed a pair the betting began at 50 cents. Not a small amount of money in the late 1980s, but limited enough that no one could get badly hurt. Just a few dollars would change hands. Then Billy suggested that the very last bet go to a dollar. Hmmm, a dollar bet followed by three raises, that would make $4 on just one card. Hey, the game was getting interesting! Too interesting, that is, too remain at an outdoor table with strangers now watching with players that came and went whenever their turn on the courts came up, with dollar bills flying around and being blown by the wind. We took the game indoors. To the apartment on the far West Side that Billy shared with his girlfriend. Now the poker game wasn’t interrupted by anything. We’d play for hours; sometimes all night. Thing had become serious. We were, after all, serious competitors. The quarters and half dollars disappeared. Now the game was $1/$2. At Billy’s suggestion, the final bet became $5, then $10. Raise that three times and…now we were talking REAL money! We mostly played a silly game, however, Baseball. Baseball was generally a 7 card stud game…2 closed cards followed by 4 open cards with a bet on each one and concluding with one final card. Threes and nines were wild. An open four got you another card. Crazy! In my first night of playing I couldn’t figure out what a likely winning hand was. Until I did! No way you could win with less than four jacks. You couldn’t feel confident with less than four aces. I built my strategy around that insight. I’d drop out early if it seemed improbable that my hand would be that good. I’d save my big money bets for the times my cards were likely winners. Billy was still the best player at the table but now I had a clear insight into the game. Two things kept most everyone else from developing the same clarity. All our players came from Carmine Street, but not all of them were paddleball players. Two of them were the court’s drug dealers. Now call me naive, but I didn’t know we had drug dealers. But, apparently, we did. And they were nice guys. They brought their “product” to the table and it was free for anyone who wanted it. As was the beer. I partook of nothing. That gave me an awfully big advantage. And then Anita Maldonado joined the game! I love Anita. She is an exciting, fun person who was also the reigning woman’s singles and doubles champion. She was among the fiercest competitors I’ve ever met. No lead over her was ever safe. She didn’t (and likely still doesn’t) know the meaning of give up. Her oft stated motto: “You’ve got to be in it to win it.” A GREAT attitude in sports. NOT a good one in poker where “you’ve got to know when to hold em, know when to fold em.” Leave a likely losing hand early and you drop a few bucks. Fight an unwinnable battle to the end and you can lose a lot! Anita, the drug dealers and a few others often fought to the bitter end. My philosophy was different. Play sober, play conservative and go in big when I recognized my cards were likely the winner. The drug dealers brought lots of cash and they didn’t seem to mind when they lost it. They just seemed puzzled when their hands were nowhere close to what the winners held. To cheer them up I’d smile and remind them: “You’ve got to be in it to win it.” No matter their probability of winning, they remained in it! In one memorable hand I was fighting it out with Anita. I held a couple of wild cards and bet strong. Anita, who didn’t seem to have much, stayed with me and then, towards the end, raised aggressively. My reading of the hand was that I was almost the sure winner but Anita’s strong bets scared me. I backed off, merely calling her at the end. “What do you have?” I asked nervously. “Four kings,” I replied, pulling in all the chips. Wow! And that’s how, though I did not win all the time at Carmine I certainly did at Billy’s! The losing, however, was not good for the drug dealers. One of them, Larry, called and asked me for a $1000 loan to help him buy “product.” He’d pay me back in a week along with an extra hundred. I declined. I’d turned my back on the opportunity to get into the drug racket! The game went on without the out of funds drug dealers, but it had grown crazy. Somehow the allowable bet on the last card had morphed to $100. Three raises could bring that to $400. None of us could afford that kind of money. One night I won close to $1000 but went home with $125 and a pocketful of IOUs. A non-Carmine Street guy joined the game. His name was Mike. His nickname was Psycho. Psycho Mike. I soon discovered why. When he learned that I was a psychotherapist he accused me of cheating by reading people’s minds. I learned from Billy that Psycho Mike generally carried a gun. I did the math: Big money, cocaine, a weapon and paranoia added to a combination I didn’t want to deal with. The Poker Game was over for me! Tony has been playing ball since he was 17 years old. 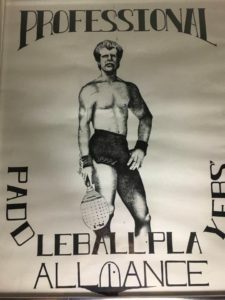 Born and raised in the Bronx, he started playing handball before transitioning to paddle and racquet, although he still prefers small-ball paddleball. A skilled lefty player, but beware of his right hand too!! Tony’s love for the sport had him traveling around the city to get games – from his early days at Yankee Stadium to Carmine Street, from Zerega to McFadden’s, from Roy Wilkins to 40th Street, from Van Cortlandt Park to People’s Park and Orchard Beach to Red Hook – there was never a lack of games. These days he considers Van Cortlandt his home park, although he spends many weekends with his family at Orchard Beach. What he considers his only vice, paddle is his therapy, playing 5–6 times a week, he can recount many a late night playing until the sun came up. Tony takes a minimalist approach to the game – keep the points short and minimize mistakes. On defense, he tries to keep the play going until he can get a set-up to make an offensive shot. His favorite shot is his low serve, which he has worked on for a long time. The advice he would give to his fellow paddleball players would be to stay focused and play to your strengths. Persevere and be confident that you’ll always have the advantage because you can adjust your game better than your opponent can. When asked what he would change about the sport, Tony confesses there are a lot of veteran players that play the game but don’t know the game – he would encourage everyone to get a better UNDERSTANDING of the rules the PFA put together and publishes on a weekly basis. Tony says he has no secret talents, but anyone who really knows him, knows he has a wicked sense of humor. His love for the game has not diminished over the years despite a double knee replacement just three years ago. 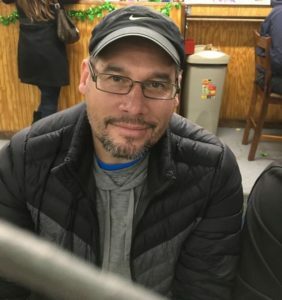 He has happily passed down his passion to his son, Anthony – kudos to the Paddleball Family Alliance (Mike Melendez, Kathy, Marcelo, Mitch and so many others) for teaching and mentoring our kids. So look out for who’s got next!! Actually, the length and content of Jimmy’s “autobiography” is an indicator of how seriously he takes the game and the true lover of paddleball that he is. He has given a great deal of thought to what makes the game tick and what needs to be done to keep it growing. The one thing he did not mention, however, is his benevolence to the sport. He is one of the greatest contributors to the game, both in terms of financial assistance and dedication of his own time and effort. 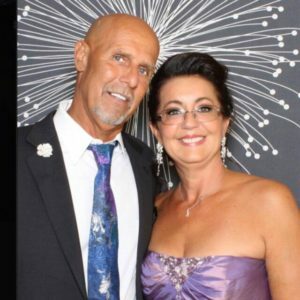 Jimmy is an attorney and was instrumental in making the PFA a legitimate non-profit organization. 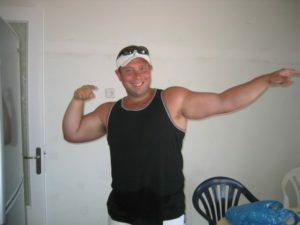 He has also provided pro-bono legal assistance to Mike on numerous occasions. Plus, not only for the PFA, but for other organizations as well, he has made cash donations, provided food for tournaments, shirts for kids and helped out at tournaments. Jimmy has been playing paddleball for 25 years, with a 7-8 year layoff, having resumed regular playing in 2017. His paddleball history starts and continues to this day at Bay 8th Street. As a child, his Dad, a paddleball player himself, took him to the park and by the time he was 16, he was playing seriously. Jimmy reflects now that having his parents close by was actually a negative in the development of his game because of the pressure he felt to impress them. Bay 8th Park shines through as the focal point in Jimmy’s paddleball life. It’s where he learned the game, hung out and made great friends. Even though he has lived in New Jersey for some time, he still comes back to play once or twice a week to what he calls the “Mecca” of big-ball paddleball. Jimmy is a big guy with a strong offensive game, always on the attack, and has deceptive quickness. Refreshingly, he is quite self-deprecating in assessing his game. He considers power to be his greatest asset, almost to a fault. He says he often tries to just blast it when he is in trouble, but “unfortunately that doesn’t work too well against better competition.” He is a right handed, primarily right side player and his favorite shot is the spike to the right corner, which he says if the opportunity is there, “I’m taking it!” He regrets that if he doesn’t hit it quite right, he usually “eats it,” especially when playing against people familiar with his game. 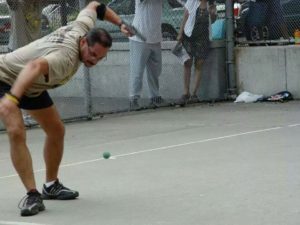 Jimmy has a long list of Bay 8th Streeters and other paddleball players from whom he has benefited from playing with and watching. Among them, Bobby Fiorentino, Bay Liu, Vito DiSpigna, Jimmy Hoe, Anthony Russo, Gene Grilli, Glen Winokur, Keith Jackson, Mike Dembin, Mitch Goldberg, Paul Angel and Dave Blatt. 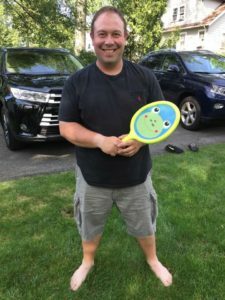 While many people in the paddleball community have expressed pessimism on the future of the game, Jimmy optimistically sees its resurgence. He cites the invasion of top young players, including Danny Fraschilla, Megan Flash, Julio Blanco, Mike Bergida, Joey Liota, Brian Romero, Ryan Lopez, Melissa Sky and Dave Blatt. He looks at the paddleball calendar and sees the summer months filled every weekend with a tournament, a PowPow or other organized get-together. But of course he knows there must be a concerted effort to have the sport grow and has some solid theories on how to best accomplish it. First, we need to balance the emphasis on competition via sponsored money-prize tournaments versus the recreational aspect of the game, making the game as much fun as it possibly can be. “I think balancing competition with community is the surefire path to success.” Also, he believes that there is a wealth of people in other sports to draw from: persons playing similar sports like handball, racquetball and tennis, as well as athletes who are “aging out” of their organized competitive sports like baseball, hockey and football. He sees pickleball as a model of how to accomplish this in that its leaders have done a great job of converting players from other sports. Jimmy is grateful that his paddleball community has been good to him. He loves that when he came back to the game last year, he was welcomed like he never left. Plus, he has made lots of new friends and “that means the world to me. Thank you all!” Jimmy, the paddleball community thanks you too! Now, next time please keep it down to a couple of pages (double spaced, 12-point font)! 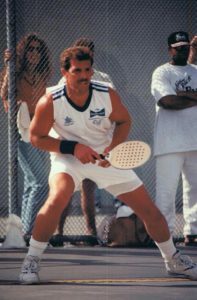 The decade of the 1980s marked the Golden Years of paddleball as the sport’s popularity skyrocketed across the five boroughs of New York. Many of the public parks were producing budding stars. At Bay 8th Street in Brooklyn a 16 year old kid named Donnie Ciaffone was attracting much attention and the word spread across the city. Donnie was gifted with superior athletic talent, chevalier social skills, and a unique, almost “rock star” presence. Yes! At Bay 8th Street the sport of paddleball was shaping its next star! Donnie was born in Brooklyn and started playing paddleball at the age of 15 at a small park on Avenue S in Bensonhurst. Eventually he was looking for tougher competition and took his game to Bay 8th, which became his home park. 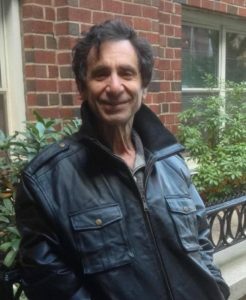 Donnie recalls, “While coming up in the sport at Bay 8th a great legend named Caesar Polichetti took me under his wing and taught me discipline, technique and how to use my left hand. I then met another legend, Rochelle Weiner Martinez, who introduced me to the games played across the city.” Donnie became one of the best players at Bay 8th, his deadly game dominated by extraordinary power and incredible spikes. The spike was his favorite shot, which he hit to all angles of the court, but yet his game was guided by a smooth, graceful glide. He made the game look so easy. At the age of thirty, Donnie moved to the Bronx where his game matured as he faced fierce competition. Donnie recalls, “In the Bronx I was spanked and taught by players like Anthony Fiorino, Robert Cheilli, Ralph Capogrosso, Craig Ruiz, Bobby Fiorentino, Fernando Frias and Mike Melendez.” Speaking for myself, I teamed up with Donnie for a number of years and I can personally say he was humble and gentle by nature, but everyone knew when Donnie was in the park! Whether at an elite private beach club against other top ranked players or in a local urban tough neighborhood park against lower-level ranked players, it didn’t matter, the man was there to play! Present day, Donnie lives in Florida and plays about twice a month at Hollywood Park. He would like to play more, but like many of us, the game he played for so many years has resulted in his body taking a beating, and it has taken its toll. 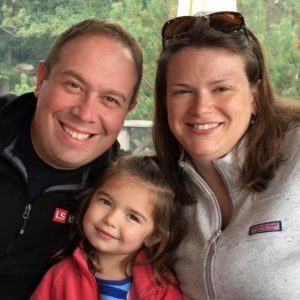 “After spinal surgery, and having both knees replaced, my paddleball game just isn’t what it used to be.” He has taken up pickleball, which is the sport he now mostly plays because it’s much easier on his body.